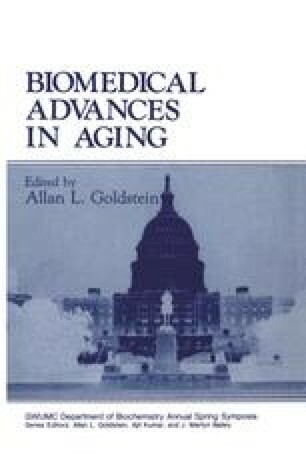 The biological processes collectively called aging are being dissected in our laboratory using classic genetic analyses akin to those used in the dissection of other fundamental biological processes, e.g., development or metabolism (Botstein and Mauer, 1982). Many pitfalls are inherent in the genetic analysis of components of fitness; many result from effects of inbreeding (Lints, 1978; Rose, 1984). These inbreeding effects have been avoided by the use of the small free-living nematode Caenorhabditis elegans. The hermaphroditic life-style of this animal facilitates the analysis of life span and senescence by permitting the direct isolation and genetic analysis of long-lived mutants and recombinant inbred (RI) lines without complications resulting from inbreeding problems (Johnson and Wood, 1982; T. E. Johnson, submitted for publication). Both approaches to obtaining long-lived genotypes have been used effectively in the analysis of the aging processes of C. elegans and the reader will find a brief summary of results below.